June 6th, 1944 marked red-letter date in the Second World War. Better known as D-Day, the 6th marked the beginning of Operation Overlord, the Allied battle plan coordinating major offensive against German forces at Normandy, France. Here, on the beaches of Normandy, the Allies would either gain the foothold they needed to bring down the German war machine, or suffer devastating defeat.The Normandy Campaign Expansion expands the Tide of Iron base game by allowing players to recreate Allied beach landings against fortified German defenses. Players can also push past the beaches into the bocage, where soldiers fight in the dense hedgerows of the countryside.The Normandy Campaign Expansion also includes: Eight new scenarios including four linked campaign scenarios Over 100 new cards including Weather and Leadership decks New geomorphic terrain boards and overlays such as beach and bunkers New AFVs, including the American M-10, and the German StuGIII, Jagdpanzer IV, King Tiger, and Panther. 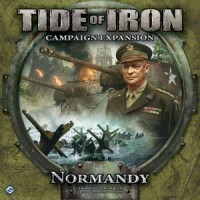 Add a Review for "Tide of Iron: Normandy"